If you have premixed pancake batter in your fridge, drop and give me 50 pushups. That stuff is loaded with preservatives and stabilizers and doesn’t taste good in the first place. If you have a box of premixed pancake powder in the pantry, you only owe me 20 pushups, plus another 20 flutterkicks. Same problem as above, plus you’re paying way too much for something you can make yourself in about three seconds. A running theme here has been slowing it down, but slowing it down doesn’t have to mean that it takes forever to get ready. And if you forgot to make the french toast the night before, then it’s never too late to whip up an alternative to cold cereal and Saturday morning cartoons. 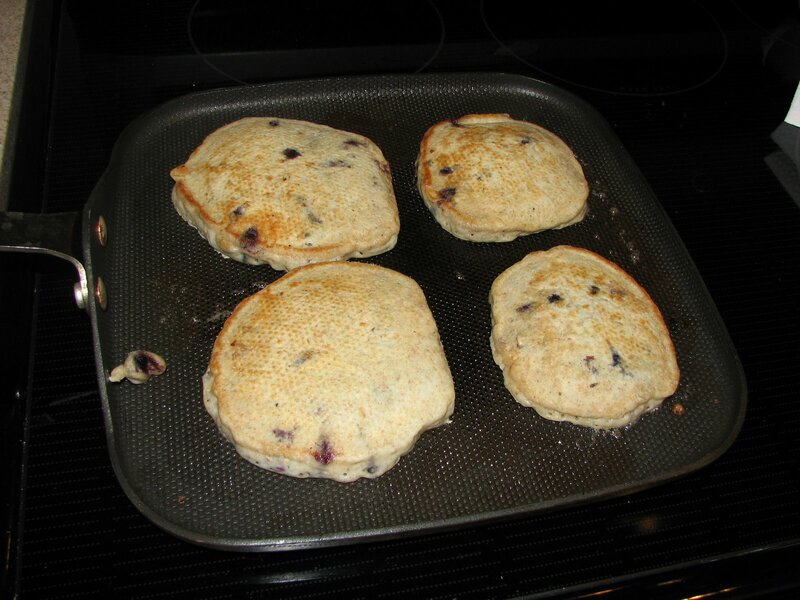 Basic pancakes are super-easy, and my version ups the fiber and protein and makes a great pre-race or pre-workout meal as well as an excellent recovery meal. These are super easy, and taste so much better than anything you’re ever going to get out of a jug or a box. Add some mashed bananas, blueberries (fresh or frozen), or anything else that strikes your fancy. But here’s the really cool thing: it takes about two more minutes to take these from pancakes that taste good to pancakes that taste great and are great for you. The second trick: add 1/4 to 1/2 cup of almonds to the mix by chopping them in your grinder, processor, or hand-chopper. About ten whacks with the hand-chopper gives you almond powder that nearly disappears into the flour, but still gives the batter a little bit of nutty texture. Take it down further and you’ll loose the texture completely for lightly, fluffy pancakes. And almonds are nutritional powerhouses, giving you an extra 3-4 grams of fiber per serving, plus protein, calcium, and Vitamin E.